I have often daydreamed about idyllic summer evenings by a lake with the sun still beating down and water warm and inviting. Families gathered on the banks of the river, kids, diving off a pontoon into the water and swimming back up to it for more. Serious swimmers taking in the whole lake. Music blaring and the smell of hot dogs and burgers waftin gin the air. I thought this was consigned to American nostalgia films, until today when I visited the Boundary Water Park in Cheshire. I can’t believe that I have never been there before. I have needed to start my open water training for an upcoming triathlon. I’d read that there’s an open swimming session held at the lake on Thursday evenings and I had naively imagined 20-30 adults in wetsuits, not hundreds of them, plus wetsuit hire, coaches, hot food, cold drink, families and best of all, 20.5c water in the lake with the sun still blazing down on this cloudless day. I felt like a kid again, eagerly rushing to get my swimming kit on. 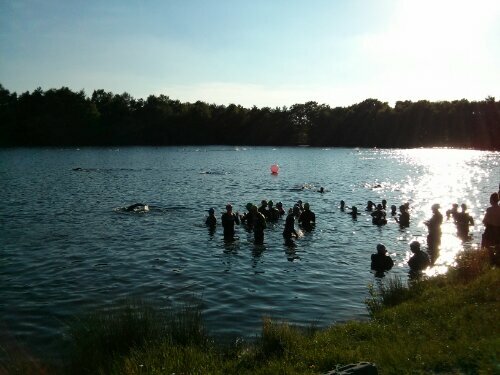 I got my wetsuit, swim cap and goggles on and started to swim with dozens of other swimmers around the 400 metre course marked with bouys. A lifeguard in a motorboat patrolled at a safe distance, and some swimmers went on to do laps of the extension making the route 750 metres. A couple of minutes in, however, and my picture postcard view of the day started to dissolve in the water as I flailed and struggled to maintain a smooth front crawl, my goggles provided poor visibility (they were an old tinted pair with a poor seal), , I kept veering off-course and then gulped a mouthful of water. I persevered, and once back at shore I adjusted my wesuit so my arm movement was unrestricted for the front crawl, re-fitted my goggles and focused on sighting periodically to stay on course. This resulted in a marked improvement, but I was still not satisfied. So on this loop went till I had had enough and I felt more at home in the open water. I was buoyed (pardon the pun) that I had improved every lap and rewarded myself with a cheeseburger and a can of Coke (subscribing to the myth that Coke kills river/lake germs) whilst chilling on the shore. Bliss.